We'll turn to ashes in this house without men, but, we won't give this miserable town the pleasure of seeing us weep. 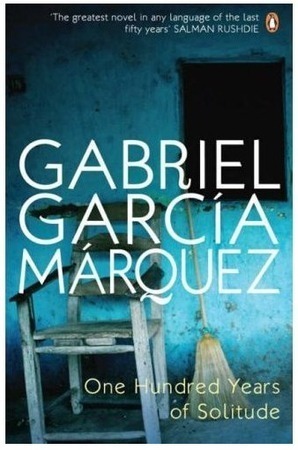 The magnum opus of Gabriel Garcia Marquez was a treat to read. Although Nobel prize in literature is not awarded to a Laureate for a single composition, yet it can be said that Marquez left a mark in the world of literature by this very novel and in the end won the Nobel prize for literature in 1982. ‘One Hundred years of Solitude’ has since then influenced the Latin American literature a lot and has been the favorite of many influential persons across the world. This book is a story of Buendia family and the author has narrated the story of the family for full eight generations. At the same time, this book can also be said to be the story of Macondo, the fictitious town where the story is set in. Through the events happening in that town, the author has described the transition of that town from an isolated place inhabited by few families to a buzzing commercial center. At the very start of the story, Buendia family lays down the foundation of the new town. In the starting, the life was quite simple and cut-off from the external world. Nomadic tribes used to visit the town, but slowly scientific advancements like electric bulb appeared in Macondo. Few generations later a railway line was inaugurated in Macondo. The older generation which has seen ships as the only way of speedy conveyance was naturally surprised. Then came banana plantation men in the town. The author has described them by their looks and language as foreigners hinting towards the colonization of Macondo. All this transition from a generation to another was done very smoothly and the author was able to portray it realistically. There are few omnipresent themes in ‘One hundred years of Solitude.’ The first one is Magical Realism. In this, the author describes many magical events and supernatural characters, which otherwise exist only as a figment of the imagination of a character, in such a way as if there was nothing extraordinary in that and that it was completely normal. Many generations of Buendia family talk to a Nomadic elder who is imaginary but is portrayed as completely normal and is someone who is expected and accepted by the family members. This concept of magical realism serves two main purposes in this novel; one, it serves as an instrument of exposition of many characters explaining their thinking and rationale behind their actions and second, it serves as a companion of Buendia family in their solitude, another recurrent theme which will be taken up later here. Exaggeration was a key element at times to make a point. The second persistent theme of 'One Hundred Years of Solitude' was cyclical nature of time. The events which happened were a pretext to another event in future. The names of many members were repeated throughout generations and there were certain similarities found in their behavior and skills. The members of the family from previous generations kept on appearing in their imaginations. Sometimes it was difficult to recall a person by his name because names are repeated so often across generations. The third recurring theme was solitude, as can be guessed from the very title of the novel. These years of solitude have led to the scientific discoveries which were well known outside Macondo but were new to the Macondo because of its isolation. Years in solitude led to learning of new languages including Sanskrit which enabled a character to tell future and this plot links inextricably to the climax. Almost each generation of Buendia family lived in solitude at one time or another and at one place or another. These years in solitude are where wisdom is reflected from the characters and where most of the philosophical content of the book resides. The author should be praised for such a lively description of the human feelings, thinking and impression of the outside world during solitude. This book also depicts the horrors of a civil war. It becomes very difficult to ascertain who is fighting whom and to separate truth from lies as a dangerous propaganda war follows the civil war by channels of propaganda such as radio, pamphlets etc. The military rule is imposed for trivial reasons. Civil liberties are curtailed for the protection of regime. This book brings out something more serious - while on the surface the regime signs a treaty and vows to work together, behinds the scenes it keeps on eliminating persons who show even slightest sign of dissidence. While the lower ranking persons keep on fighting with all their might, the civilian leaders try to strike a deal with other side and clinch the deal when small favors are done to them leaving aside years of idealism. "The world must be all fucked up," he said then, "when men travel first class and literature goes as freight." Hey! Congratulations, this post has been featured in Collective: A Book Lover’s Stash For Monsoon 2016 on August 18, 2016. Great job and keep on blogging!